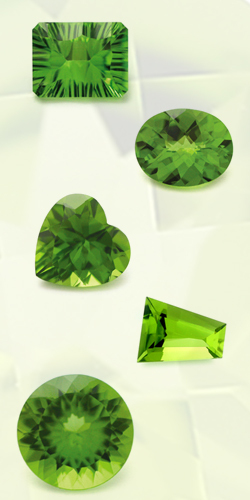 Peridot is one of the few gemstones, which exist only in one color. Its color agent is iron that accounts for the deep green color with that slight golden hue. Chemically Peridot is just an iron-magnesium-silicate, and the intensity of color depends on the amount of iron contained. The color as such can come in any variation from yellow-green and olive to brownish green.